I went to a funeral on Saturday. My friends, the Gingrich Family, were celebrating the life of their 33 year old daughter, Wendy. Now, I’ve been to funerals where many stories were shared, but never like this. The stories shared about Wendy were beautiful and funny and make my cry just thinking about them. The one that has stuck itself into my brain is about when she saw a cross. It’s important to note that Wendy had autism. It’s not important because it diminished her ability to live and love. Nope. It’s important because it gave her a different way of seeing the world. A way of looking at things that made me a better person. I know I am not the only one. Anyway, as the story goes, Wendy’s parents had to take a detour on the way to church. She hated detours. Hated anything that was outside the routine. She grumped about it until she saw a cross. Trying to point it out to her parents, she said it was like what they had at their church, hanging over the adoption water. That was what she called the water in which one is baptized. How absolutely perfect. That story broke me. Breaks me still. But in a wonderful way. There was a time in my life where baptism was presented as a “ticket to heaven”, a way into the good graces of God. And, when some talked to me about it they tagged on, “If you don’t, you’ll go to hell”. It was something that, in my heart, I dreaded. I knew it had to mean more. I wanted it to. It had to have a deeper purpose. I’m a writer. I should have been able to articulate what baptism truly is. I simply couldn’t. Even after my own baptism, words to explain what had happened escaped me. Saturday, I was given a gift, one last precious gift from Wendy Gingrich. She gave me the two words I needed to understand, truly, what baptism is. Adoption Water. 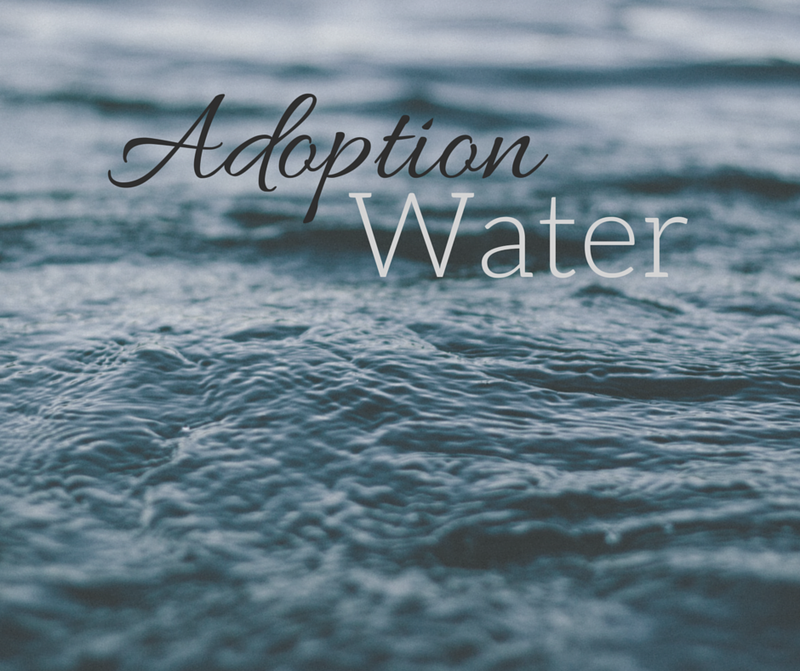 Baptism is letting go and allowing ourselves to be adopted. It’s surrendering to the love and acceptance of our Father. Just thinking about it makes my hands shake, makes me cry. Makes me so very thankful. One of my favorite things to do when someone at our church was baptized was to watch Wendy. She’d keep her eyes on the person. When they came back up out of the adoption water, she’d stick both thumbs in the air, whistle, and her face would spread wide with the best smile in the whole world. I remember one time asking God if that wasn’t the most beautiful sight He’d ever seen. LOVE this. Beautiful imagery. Thank you for sharing Wendy, and her perspective. Joanne, you would have loved Wendy so much. What a gift she was to us. Reblogged this on Between Me and God. I’ve been feeling them all the past week. Thank you Susie. I consider myself very fortunate to have known Wendy. I loved her thumbs up. We’re all better for having Wendy in our lives. Thumbs up. Talk about God bumps! How perfectly precious! Calvin, Mathew Henry and Martin Luther all rolled into one have not been able to describe it better! That is exactly what it is. So glad I hadn’t already showered and shaved, because the hairs on my legs just grew an inch! Wendy had such a wonderful way of seeing things. She was a treasure.